HerbaXylaRedd is a research project funded by the Belgian Science Policy Office (BR/143/A3/HERBAXYLAREDD). Worldwide, the federal Xylarium (Royal Museum for Central Africa, RMCA) and Herbarium (Botanic Garden Meise) are by far the most important reference collections for Central African forests. In order to strengthen their reference value, HERBAXYLAREDD aims at generating knowledge, through analysis of specimens’ traits and meta-data, on Central African forest ecosystems and forest products. Newly generated data will allow exploring functional strategies, growth and the genetic structure of tree species, an optimized distribution map of tree species, technological aspects of lesser used timber species, carbon stocks of forests and energy content of Central African woody species. Given the high diversity, we will focus on target groups: dominant forest species, lesser used timbers and species for bio-energy. The study of each of these target groups involves specific scientific questions and will provide quantitative data needed for policy-making. HERBAXYLAREDD combines collections that are often directly linked because herbarium vouchers and wood samples of the same tree were collected and separately stored in the Herbarium and Xylarium. The two research institutes with collections cover the fields of wood anatomy, dendrochronology, genetics and botany, but knowledge on plant ecology (ULg), wood technology (UGent), metabolites of wood (FWS) and cartography (ERAIFT) would substantially improve the data than can be obtained based on the collections. Thus, the network of HERBAXYLAREDD includes 6 partners with complementary skills. All Belgian partners have a prolonged record of research in Central Africa and mutual bilateral collaborations running. The first international partner is a regional African research institute (ERAIFT) that has joint PhDs with the Belgian federal institutions and extended expertise in cartography, management and conservation issues of the Central African region. The American partner (FWS) runs a highly specialized laboratory with lots of experience on metabolites of wood in the context of enforcing laws and regulations of timber trade, including CITES. The project encourages interaction between scientific partners working on the same plant material but with different and complementary approaches. First, the number of herbarium and xylarium samples in common within the Congo Basin will be determined by screening both collections. Herbarium vouchers can be used for the botanical validation of the wood specimens and the combined ‘voucher-wood’ dataset will be structured in a standardized way. Once this framework is set, the implementation of the renewed database can start. Within this work package, all partners will be involved in the measurements and analyses of traits on samples from the Herbarium and/or the Xylarium. Those results will be used for the analysis of the functional ecology of African tree species, the mapping of species’ distributions, the study of wood technological aspects of lesser used timber species and the development of identification keys/atlases. Next to these research activities, two transversal tasks are present throughout HERBAXYLAREDD for the project coordination and the dissemination of results to all stakeholders like policy-makers, enforcement officers, collection curators and the international research community. In the end, a complete description of a considerable number of tree species will be available and offers direct perspectives for further projects or PhDs in several disciplines. The resulting data, set in a region where the lack of data is still persistent and fieldwork is difficult, will also be used to produce policy underpinning tools that help the enforcement of conservation mechanisms (e.g., wood density data for the estimation of carbon stocks in a REDD+ context) and certification systems (e.g., the distribution of species and their growth performance for the estimation of sustainable production). Moreover, identification keys will particularly be developed for use by, e.g., customs in such a way that they will be able to separate material that needs to be send for analysis in specialized laboratories. International conservation mechanisms and conventions like CITES are in need of quantitative data on protected or endangered tree species that can be delivered in a comprehensive way by this project. 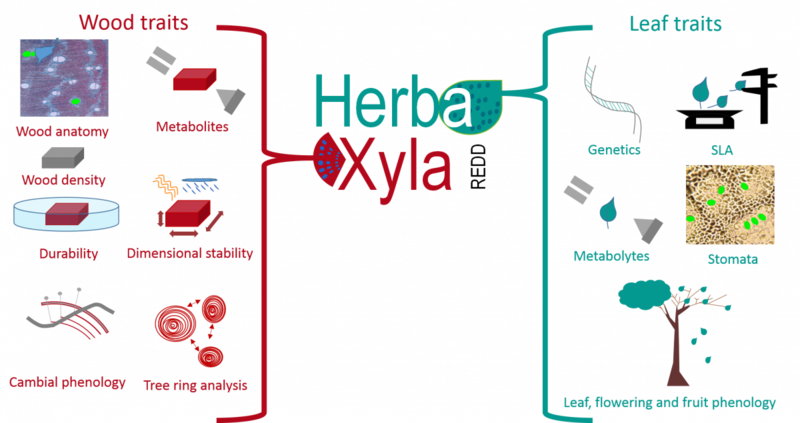 Finally, both the Xylarium and Herbarium have an open access online database that will be adapted to insert all newly generated data whereas existing specialized databases (e.g., DRYAD) will also be provided with the newly generated information on specific traits. Thus, a unique reference collection on African tree species traits will be available, encouraging (African) scientists to study new case-studies, to expand the number of tree species, to gain more insight in the Central African forest ecosystem and to transform the knowledge from integrative databases into (national) strategies for sustainable forest management, forest conservation and financial compensation for carbon stocks.